Known mainly as the grain served with the North African vegetable and meat dish of the same name, couscous is a wonderful side dish for any grilled meat, fish or vegetables. 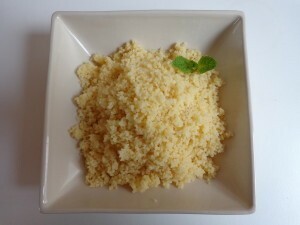 Its preparation used to be a time-consuming process that involved rolling, steaming and sieving the grain — but now, thanks to the instant couscous sold in supermarkets, it can be made in less than five minutes. The key is to use exactly as much water as grain. I often do this by measuring the amount in identical glasses set side by side to check the level. Heat the water and salt in a small saucepan. When it boils, pour in the couscous and swirl the pan to make sure the water covers all the grain. Immediately turn off the heat, cover the pan and let it rest for 5 minutes. Remove the cover and break up the couscous with a fork. Add the butter, mix in, cover the pot and place it over over very low heat for a minute or two. This allows the couscous to steam and fluff. Serve at once. Serves 2 generously.